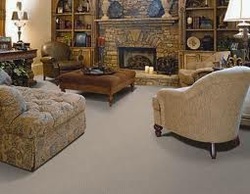 Our state-of-the-art steam extraction carpet cleaning system is the ultimate in soil and stain removal. Operated by trained technicians employing professional-level product knowledge. This system deep cleans and sanitizes your carpets and upholstered furniture. Our trained, experienced technicians work as a team to move and replace most pieces of your valuable furniture safely and carefully and place a protective foil under the legs to help prevent carpet marks. Application of a soil retardant solution is available to help protect your carpets and upholstery against future staining and resoiling. Cameo has built a reputation for prompt and customer friendly service. Our knowledgeable office staff can tell you more about our Truck Mounted Steam Cleaning. For personalized service, please call us at 201-796-1844 between 8:15AM - 5:00PM Monday thru Friday or email us at cameoservices@yahoo.com.